Expedition 50 Flight Engineer Thomas Pesquet of ESA (European Space Agency) and Commander Shane Kimbrough of NASA commanded the International Space Station’s Canadarm2 robotic arm to release a Japanese cargo vehicle at 10:46 a.m. EST. At the time of release, the station was flying 261 statute miles above the south Atlantic Ocean. Earlier, ground controllers used the robotic arm to unberth the cargo craft. Japan Aerospace Exploration Agency’s (JAXA’s) H-II Transport Vehicle-6 (HTV-6) arrived to the space station Dec. 13, after launching from the Tanegashima Space Center in southern Japan Dec. 9. The cargo ship will now move to a safe distance below and in front of the station for about a week’s worth of data gathering with a JAXA experiment designed to measure electromagnetic forces using a tether in low-Earth orbit. JAXA is scheduled to deorbit the craft on Feb. 5. Loaded with trash, the vehicle will burn up harmlessly over the Pacific Ocean. I was viewing the fly over of the ISS on 1-27-2017 from Ocala, Florida this evening at 6:48 PM local time (ETS). Fly over was dead over head. I noticed another space vehicle approximately 100 miles ahead of the ISS. Knowing the ISS is traveling @ approximately five miles per second, I counted from a point where I saw the lead satellite and came up with the estimated distance of approximately 100 miles between the two. I came to find out that the lead satellite is a Japanese HTV Cargo ship which left the ISS earlier in the day. What a great view and something different to see on this fly-over. 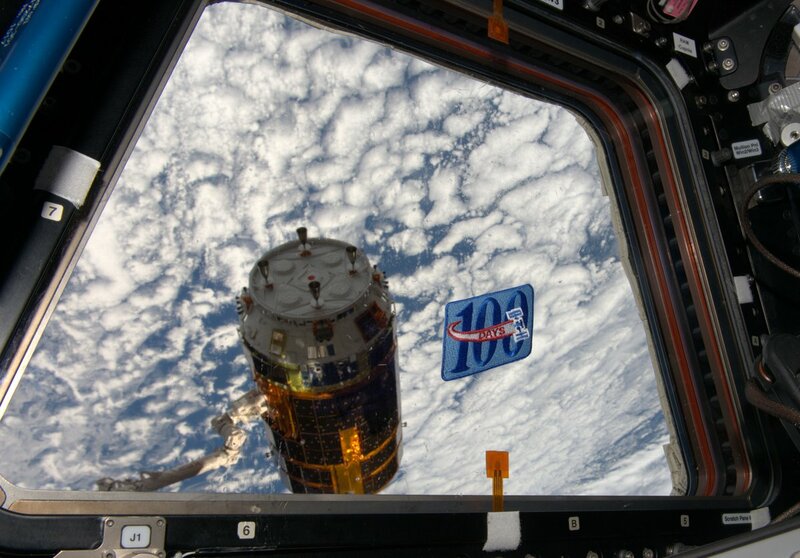 As of Jan. 30, the HTV-6 is about 1000 statute miles away from the ISS. Hi Sean. Very nice pic! How long was the exposure? If you have a Twitter account you can tag us at @Space_Station and/or use the hashtag #SpotTheStation. I was viewing the space station from earth this evening using the spot the station info and as I saw the station pass over I was also able to see a fainter object ahead of the station. It was red in color and dimmer than the station. I wonder if it was the cargo ship released earlier today at 10:46am EST. Yes. As of Jan. 30, HTV-6 is about 1000 statute miles away from the station. I was watching the ISS last night 1/27/17 from Jacksonville FL around 6:50. I was able to see two objects traveling near each other. I’m wondering if the frist was HTV-6 being followed by ISS?